🎧 We are reviewing the FiiO BTR3, a Bluetooth amplifier with advanced features. The FiiO BTR3 features a CSR8675 Bluetooth chip, a AK4376A DAC, USB DAC functionality and support for all wireless audio codecs. 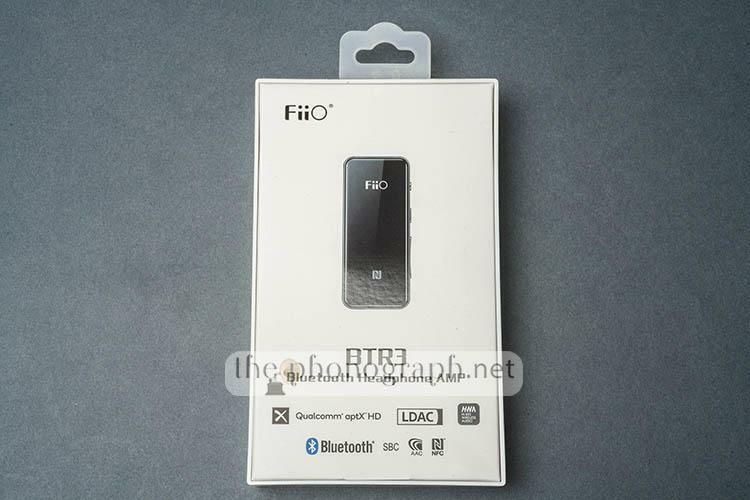 The FiiO BTR3 is the 3rd generation of Bluetooth receivers from the brand, preceded by the FiiO BTR1 and the FiiO μBTR . FiiO BTR3 weight in Ounces and FiiO BTR3 weight in grams. The FiiO BTR3 unboxing results in a lanyard and a charging USB-C cable that it is also used to connect the unit as an USB DAC. The unit comes inside a small package with a classic clean design of most FiiO products. The latest generation of FiiO products (like the FiiO M3K ) are being designed with an unibody main housing. The FiiO BTR3 follows the same clean aesthetics, has a clip on the back and presents a front section made of glass, which adds a fancy smartphone-like finish. With a size of 58mm×25mm×10.4mm (back clip not being measured), the FiiO BTR3 is a Bluetooth amp that can be carried in any pocket. The FiiO BTR3 can be controlled with 4 buttons that are placed on the right edge of the unit. A single press: Play, Pause music or Answer/End calls, reconnect. Pairing Troubleshoot: if your unit is no longer entering pairing mode. Do the following: 1- press and hold the power button for 10 seconds; 2- if the FiiO logo is not flashing red and blue, press and hold the “play/pause” button for 3 to 5 seconds; 3- done, the BTR3 will reset and get forced to enter pairing mode. The FiiO BTR3 holds a 300mAh rechargeable battery that grants 11 hours of continuous music listening (AAC codec) on a single charge. The FiiO BTR3 is charged through the USB Type-C connector on the bottom edge of the unit – a full charge should take approximately 1.5 hours. FiiO recommends to charge the FiiO BTR3 using a charger that outputs 5V 0.5A. The FiiO BTR3 has an extraordinarily rugged construction with a metal unibody construction and a 2.5D front glass with oleophobic coating to reduce fingerprints- even the back clip is made of metal. Overall, the unit feels extremely durable and light. The FiiO BTR3 has two of the most diffused and standardized ports: a 3.5mm audio jack and a USB Type-C for charging and for USB DAC mode. Both connectors are placed on the bottom of the unit, the USB port is on the right edge and the 3.5mm jack on the left edge. This allows the FiiO BTR3 to transform into a wireless Bluetooth device any headphone, earphone, speaker, home audio and car audio system – using a 3.5mm cable. For example, if you ever wished a wireless Meze 99 Classics or 1MORE Triple Driver Over-Ear, now you can simply connect them to the FiiO BTR3 and have a Bluetooth Meze and 1MORE over-ear headphone . As mentioned before, this is not only limited to earphones and headphones, you can also use the FiiO BTR3 with your wired home audio /home theater system /speaker and with your car audio system to transform them into a wireless system. The FiiO BTR3 is equipped with a Qualcomm CR8675 Bluetooth chip, a low-power model with a 120MHz DSP which supports 24-bit transmission and processing. Moreover, the brand grants 30 meters of Bluetooth transmission (on open areas), which is 3 times more than the standard 10 meters of most Bluetooth devices. More than obvious by now, the FiiO BTR3 can be paired with any smartphone, tablet, PC/Mac and device that can connect to a Bluetooth receiver/amp. Many Bluetooth receivers, BT amps and BT cables show a treble boost and/or are very rolled-off on the lower bass end, the FiiO BTR3 did not exhibit any of these “issues”. Our FiiO BTR3 soundtests and measurements revealed that this Bluetooth receiver that does not boosts nor recesses any audio frequency, except for an insignificant rolling off above 20kHz and only in some modes (aptx/aptx low latency, USB DAC). In addition to this, the FiiO BTR3 did not colored, warmed up nor cooled down the sound, resulting in a neutral sounding wireless amp that preserves the true sound of your headphone, earphone, speaker, etc. FiiO ensures that the FiiO BTR3 has a drive ability of 16Ω~100Ω. Still, we were able to drive higher impedance headphones of up to 250ohm without much issues and with a respectable output power. The FiiO BTR3 can reach an output power of 33mW (16Ω), 25mW (32Ω) and a SNR of 120dB. With an output of 25mW (32Ω loaded), the BTR3 offers the same power of the FiiO M3K. Connected to a less efficient headphone such as the HIFIMAN HE400i , the little FiiO BTR3 managed to drive them acceptably well – if the FiiO is set to the max volume setting and the smartphone is set to the max too. The AK4376A DAC inside the FiiO BTR3 grants a SNR of 114dB and distortion of -107 dB. Further technical specifications include a frequency response of 20Hz-40,000Hz on a LDAC connection, 20Hz-20,000Hz on aptX connection, with THD+N ＜0.003%(LHDC 1kHz), and an output impedance of <0.3dΩ (32Ω loaded). The firmware of the FiiO BTR3 can be upgraded through it’s USB Type-C connection. The upgrade process can be a bit complex for average consumers. If you do not feel confident about doing this you might be better skipping the firmware upgrade, as an erroneous update process might lead to a non-working unit. The brand is also working on a new firmware that will add compatibility with the FiiO Music app. After downloading, unzip the package and install the upgrade tool directly by double clicking it (.exe file). In general, please try not to change the default installing path during the installation process. 1. Power on the BTR3, and hold Multifunctional button (which is in the middle of the Power button and Volume buttons) for about 5 seconds, then the red and blue lights will flash alternately. 2. Hold the Multifunctional button and Volume ”+” button for about 5 seconds, to make the BTR3 enter DFU mode (The indicator will turn OFF after done). 3. Please do not press any buttons on the BTR3 at this time, and just try to connect the BTR3 with the computer by the Type C USB cable came from BTR3. To check if the BTR3 is successfully connected, go to Device Manager and see if there is a “CSR BlueCore in DFU mode” displayed under the “Universal Serial Bus controller” category. If there is, it means the BTR3 is connected with the computer successfully. 1. Run the upgrade tool (DfuWizard.exe) which is installed in Part A (Here is the path: C:\Program Files (x86)\CSR\BlueSuite 2.6.4\DfuWizard.exe), then click “下一步” which is referred to “Next”. After selecting the firmware file, click “Next” to continue. 5. Please wait patiently for the upgrade to complete and do NOT operate the device during this process. 6. If the below menu appears, it means the upgrade is complete, click “Finish”(完成) to close the application. After that, please disconnect the BTR3 from the computer and restart it before use. ATTENTION! : Extreme caution should be taken when upgrading the firmware of the FiiO BTR3 or the unit could become non-functional. The FiiO BTR3 is an excellent Bluetooth amp/receiver that exhibits a frequency response and sound quality exceeding it's price tag. The market is full of Bluetooth adapters that cost little money, so you might be wondering what sets the FiiO BTR3 apart from brand-less models. The FiiO BTR3 is more than a simple Bluetooth adapter, this little gadget can also be used as an USB DAC with any computer and smartphone, provides whopping 33mW of output power and offers a flat frequency response and uncolored sound that conserves the same original sound personality of your favorite headphones.